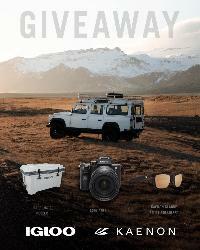 Prize: Sony A7R III Camera + an Igloo Cooler + a Pair of Kaenon Clarke Sunglasses ($2,500). What you must do to enter: 1. Follow - @igloocoolers and @kaenon on Instagram. 2. Tag a friend in the comments, one friend per comment, more tags for unlimited entries. 3. Like the post. Statistics: This contest was opened by 131 and entered by 6 ContestChest.com members. 5% of those who opened the contest, entered it.